We get an opportunity play a few games on Jersey Jack Pinball's new Dialed In. Pat Lawlor worked on this title for nearly 2 years, citing when it was announced that he was joining the Jersey Jack team that he would have creative freedom again like he did back in the Williams days. This third title for Jersey Jack would be the first standard body game, yet packed with features like Lawlor's titles often do. This theme sort of ties into his existing whirlwind and earthshaker themes as a disaster city, but this time updating it to modern times where a rogue cellphone begins causing the havoc. This game features a hologram that is similar to the premium/LE Stern Ghostbusters. It also has a built-in camera that takes selfies during the game. Lastly, it also has Bluetooth that can pair with a phone, and allow the player to control the flippers remotely, a first in pinball. 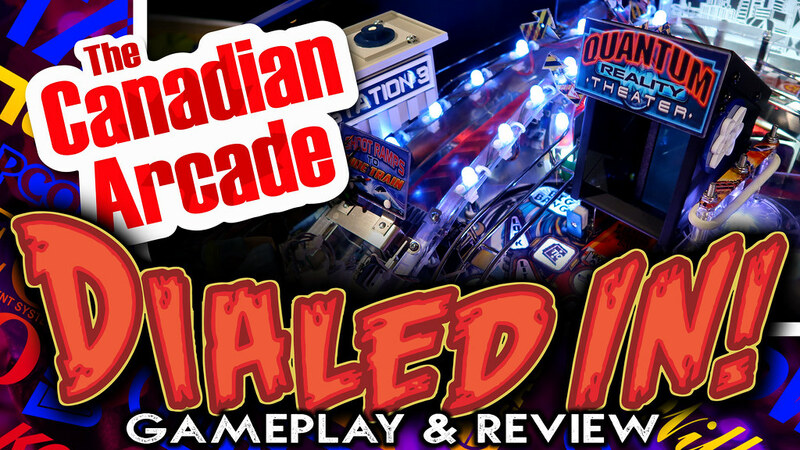 Special Thanks to Tommy Floyd and the gang from Nitro Pinball, as well as the folks from YEGPIN and Edmonton Diehard Pinball for helping us make this video! Check out Jersey Jack Pinball for Information on Dialed In, The Hobbit, and Wizard of Oz pinball machines. 2 - same crisscross layout he's been farting out for 30 years. 3 - I have to laugh that he shows up at Expo 12 years ago and craps all over the collectors yet here he is with his name all over something that will ship 1,000 units tops with 90% of them going into homes. 4 - I think it's a mistake to bring the same designers back that ran companies into the ground in the 90s. I played that at the Midwest Gaming Classic. The theme might be cool if you are twelve. I didn't like it. I also didn't like the fact that a guy had to stand next to me an explain what to do. I like the simpler games. Some of those new ones are ridiculously complicated. It's an original theme, at least, and the JJP games are well built physically. I have little hope of ever seeing one on location around me now that our primary pinball location is dead. This will end up being one of those once a year at a show and you have to wait out the 3 guys who stay on it all night and won't rotate anyone in. I got a chance to try this one at the last Midwest Gaming Classic. It didn't wow me, despite all the gimmicks. Also, I'm not a fan of TV displays on the backglass. Maybe it just hasn't been done well, yet, but, in addition to Dialed In, I've tried Wizard of OZ, Batman '66, Aerosmith and in all cases it just didn't seem to be more than a distraction, not to mention that the screen is so large that you sometimes have multiple video images going at the same time on one screen and without a standardized layout it can be difficult to get information at a glance while the ball is in play. Maybe it will grow on me, but for the moment it seems to only be better for the audience, rather than the player.